Is it possible that mares play a more important role in breeding elite thoroughbred racehorses than stallions? Australian and Chinese researchers have unearthed evidence that points to the important contribution quality mares make to the racing performance of their offspring. Xiang Lin and his colleagues, writing in the journal, Reproduction, Fertility and Development, noted that many studies had focused on identifying the genes associated with the athletic ability of thoroughbreds. “But few have considered differences in maternal and paternal heritability of athletic ability,” they said. The seven researchers looked at the career race performances of a pool of Australian thoroughbreds. They looked at their prize money, and ranked the horses based on their average earnings per start. The top 30 percent were considered elite and the bottom 70 percent were categorised as poor. Poor dams and poor sires. The race performance of the foals was then compared between the four groups. The best performers were offspring that boasted both an elite dam and elite sire. However, surprisingly, the offspring of a poor dam and elite sire proved to generally be worse performers than those categorised as having been born to a poor dam and poor sire. The offspring of elite mares generally produced superior results, regardless of the category in which their sire fell. “The results show that the heritability of race performance between dams and foals is much higher than that between sires and foals, and that this difference is statistically significant,” the research team concluded. They also examined the effect of the child-bearing age of dams and sires on the ratio of elite foals. 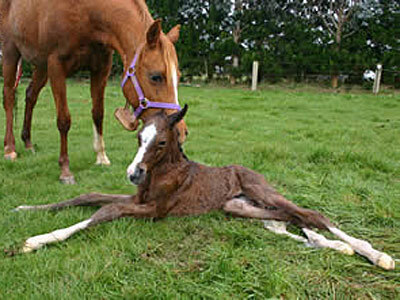 “We found a strong correlation between the number of elite foals and dams’ child-bearing age, with the ratio of elite offspring reaching a high level between a child-bearing age of 8 and 11 years. Xiang Lin, Shi Zhou, Li Wen, Allan Davie, Xinkui Yao, Wujun Liu and Yong Zhang.